This month’s labor market data is a mix of good news and bad news, with a dash of confusion thrown in for good measure. Another tidbit of good news: help wanted ads also surged in June, indicating that employers still have positions to fill. Now, for the bad news. 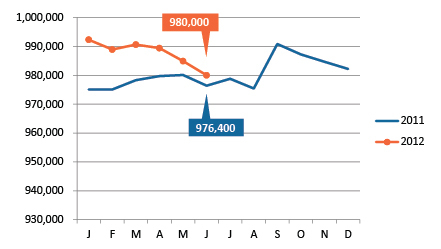 The Kansas City area’s employment (using seasonally adjusted CES data) declined for the third consecutive month, finishing at 980,000. Overall, we’ve gained only 3,600 jobs since June 2011. The confusion comes in with conflicting signals about the way the economy is headed. The unemployment rate went down, and total jobs went down, too. Normally, we would expect that the only way this would happen is if labor force is declining more slowly than employment. But labor force increased. What is going on? There are two main reasons for the conflict. First, the labor force and unemployment data are derived from a different source than the jobs data, and the latter series is seasonally adjusted while the former is not. Different sources can give different views of the economy. Second, conflicting data most often occurs when the economy isn't moving strongly in a particular direction. The very fact of conflicting signals indicates an economy that is still struggling to regain its footing three years after the recession officially ended. The economic recovery has paused, and though our guess is this pause is temporary and that growth will resume more strongly later in the year, such a pause is worrisome. Just how worrisome it is depends on how long it lasts. The next few months will be critical as we move into fall and businesses reassess their hiring plans in preparation for 2013. For more on this topic, see the post on our KCEconomy blog. For the third consecutive month, seasonally adjusted employment declined according to Current Employment Statistics (CES) data. The region is just barely above the employment level from one year ago. But as the article to the left explains, employment data varies widely this month, depending on the source used. As expected, the labor force jumped in June, increasing by 15,720. This reflects new college graduates entering the workforce. [Definition: The number of unemployed as a percent of the total labor force.] 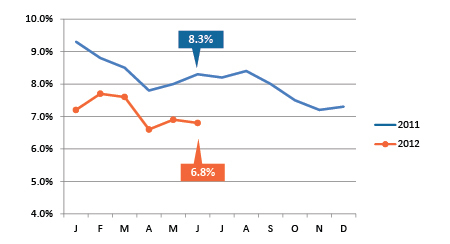 Kansas City's unemployment rate actually dropped slightly from May to June, despite the increased labor force. 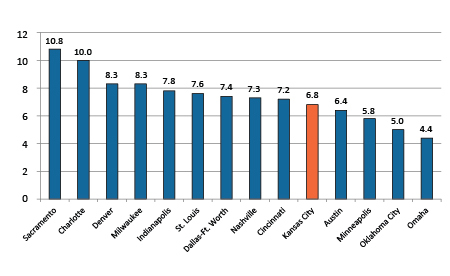 Of our peer metros, Kansas City was the only one to see its unemployment rate drop from May to June, and only four of the 13 peer metros had lower unemployment rates. 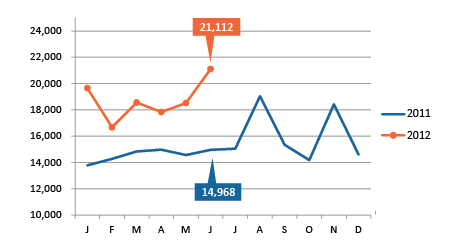 Job postings spiked in June to more than 21,000 — a significant increase over this time last year. Venus and engineers from Mars? In a recent blog on KCEconomy.com, author Jeff Pinkerton, senior researcher at the Mid-America Regional Council, looks at trends in employment by gender. Teaching and nursing occupations are dominated by women (77 percent and 93 percent respectively), while men tend to dominate engineering (86 percent), construction (98 percent) and IT (76 percent) occupations. How do gender-dominated occupations affect supply and demand ratios? How big an impact does this have on the pool of available workers?